tied the school record for the most wins ever by an Xavier rookie head coach (26). Modeled after the break the Phoenix Suns ran under Mike D'Antoni, Coach Chris Mack reveals the principles and rules of the structured fast break. The Suns ran this transition offense using both missed and made shots. But Coach Mack concentrates on exclusively on missed shots, which he believes gives his team an attacking mentality by focusing on the defense when it's most vulnerable-in transition. Coach Mack explains the importance of playing good defense in order to limit the number of baskets made by opponents. But he also stresses the value of getting players in position to make "cheap baskets" or quick transition hoops, second-chance points off offensive rebounds, baseline out of bounds plays, and free throws. Against an equal or slightly superior opponent, points added from "cheap baskets" could mean the difference between winning and losing. Throughout the DVD, Coach Mack emphasizes the importance of maximizing personnel. This requires either putting a set rules in place for each player and each position in the break, or relying on point guard to take over as the "floor general." He goes on to share four rules for point guards beginning with the idea that they receive all outlet passes. The other guard and small forward, whom he calls wide runners, run the sidelines to the corner to spread the floor and the defense. There are actions for them to be on the opposite sides (split) and on the same side (paired). If the rebound goes to a player who is considered a "capable" ball handler, the point guard can become a wide runner, as well. The first post down court is the rim runner. His job is to look for an over-the-top pass, or to seal (steal?) a quick posting opportunity. He will head for the ball opposite the short corner if he doesn't receive a pass. Then comes the trailer, normally the post who grabbed the rebound and passed the outlet. He will set a ball screen for the point guard and either roll hard to the rim or pop to a place where he can make a shot. 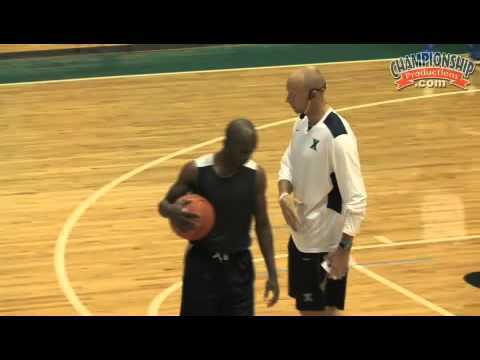 Coach Mack continues his tutorial describing how to make an open side work in a two-man game. He explains how to exploit the vulnerability of the defense by attacking them when they are in rotation. In addition, he demonstrates the step-up screen, back screes and stagger screen as well as a run-the-circuit drill. He ends the clinic with a question and answer session on hard hedging, double teams, quick hitters and multiple position players. The transition game will get your players into an attacking frame of mind that will influence other aspects of their game and their lives. Produced at the Fall 2013 Wilmington (NC) clinic.